Skijoring. Skijoring? Ski. . . .what? The definition of skijoring can be brief. Skijoring is a Scandinavian word meaning “ski-driving”. It involves a skier being pulled by a dog in harness. Blah. I can do better than this mundane definition. Imagine hooking up and moving at the same pace as your dog when he’s zooming and playing. Imagine zooming and playing with him like that! Would you like to actually be a part of a working dog team, without having to own multiple dogs? You can stride and glide across the snow at downhill speeds and conquer a new sport, all while watching your best buddy learn a new skill and get his fill of exercise to boot! You just might become one of those outdoor addicts, who pray for snow and make the people around you turn up a lip and say, “thhttttt” when you reveal that you’re tired of fall. “Bring on the snow, and lots of it!”, you’ll cry. Because once you give skijoring a try, there’s no going back, for you or your dog. Europeans have been teaming up with their dogs to go out and ski the trails and backcountry for generations. In fact, as a competitive sport, it is very popular and important in the Scandinavian countries. Here in North America, it’s beginning to catch on as swiftly as some are moving on their skies! The popularity of this new past time grows out of the sheer simplicity of it. You don’t need a northern breed or any other kind of special dog for skijoring. Any dog 30 lbs or bigger is a great candidate for pulling and you’d be hard pressed to find one who won’t want to try it. Also, you don’t have to be a great skier to do this, so long as you know how to fall because you’ll probably do a bit of that in the beginning. 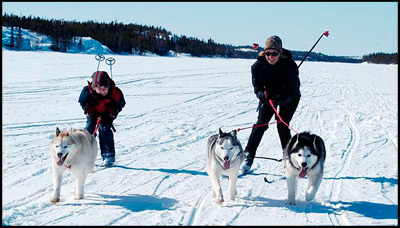 To get started you will need the proper equipment which is readily available through sleddog supply companies. 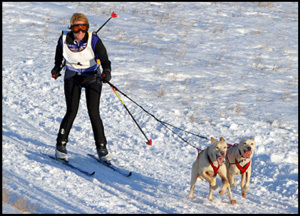 www.canadog.ca specializes in skijor equipment and actually offers clinics. In fact, I bet if you look in your area you might find a club or organization eager to get you going! All you need is a belt for yourself, a line w/bungee and a harness for your dog. When hooking up for the first time, it’s best to find a groomed trail as this will make it easier for your dog to pull you and also provides a sense of direction for you both. The first couple of times out, make sure you don’t overdo it! The exhilaration of gliding along behind your dog is hard to pull away from, but remember that you and the dog are learning something new and so are your muscles and body. Even if your dog is used to running several miles at a time, in harness it’s a whole new game. Probably the most important aspect to doing anything new with a dog is to set them up for success. You should always try to make the experience as positive as you can. Part of this will be learning to stride and pole and work with the dog. The overall feeling changes when you become a real team and if the bond wasn’t close enough already, expect it to grow deeper. Positive is one of many words that come to mind when thinking of a healthy, rejuvenating experience in the great outdoors with your best friend. If you can involve your family, perhaps children of appropriate age and size, it becomes an overall win/win idea. Some enthusiasts take it a step further, and pull their tiny babies and toddlers with them in a sled or pulka. Don’t shy away from the word, “sport” because the other side of skijoring is purely recreational. It’s just you and your dog out for a walk, but for once you don’t have to keep asking your dog to stop pulling in front of you. In fact, you’ll encourage it! Some dogs will be faster than others, and if you care to team up 2 or more, watch out! Now you’re into extreme sports. But, for the average pet, this will more often turn out to be a peaceful, refreshing trek down your trail of choice. Isn’t that how life should be! Please consult your vet if your dog has any health issues, might be up in age, or isn’t usually very active. One more great benefit of skijoring is that the dog is choosing the speed and energy level at which he might like to pull on any particular day. “You can’t push a rope” so to speak, nor can you make a dog pull. Keep that in mind as you begin this sport. If your dog is out front pulling you it’s because he wants to, just like you’ll want to be putting on your skis and hooking up with him at every opportunity mother nature and her snow provide. So. . . . . . Skijoring? In definition, FUN, EXHILERATING, REFRESHING, POSITIVE, SPORT, RECREATION, WIN/WIN. 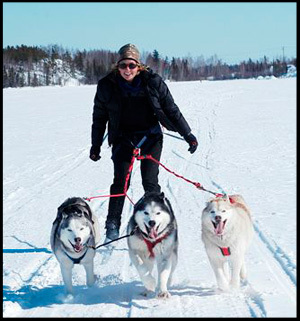 About the Author: Shelley Ramsay and her husband, Rob, are the owners and operators of Canadog Kennels and Skijor Supply – www.canadog.ca. Shelley and Rob have been competitive, as well as recreational skijorers since 1998. They have competed in limited sprint races in the North West Territories, Yukon, British Columbia, Alberta, Saskatchewan, Manitoba and Minnesota. Over the past 5 years, they have both consistently ranked in the top 3 for skijoring in Canada and represented the country in Nordic Events at the 2005 IFSS World Championships in Dawson City. Sleddog racing for Rob and Shelley began with Skijoring with Siberian Huskies and has evolved into a competitive limited class kennel of Alaskan Huskies. Today, Canadog Kennels is home to 6 Siberian Huskies and 18 Alaskan Huskies.Rob and Shelley also own and operate Canadog Supply in Yellowknife. Canadog Supply specializes in the manufacturing and distribution of skijor equipment and custom made dog harnesses, collars, coats, belly blankets, and a variety of lines, rope and other equipment. Canadog gear is worn by some of the most successful distance and sprint kennels in mushing as well as most skijorers in the Western Canadian circuits. They’ve recently expanded into the European market with their skijor equipment.